Transactions of the Doppelganger Society - ZineWiki - the history and culture of zines, independent media and the small press. 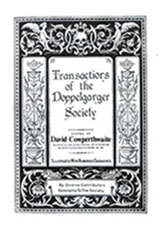 Transactions of the Doppelganger Society was a literary supernatural and horror publication edited by David Cowperthwaite. Published in 1990, this was a one-off booklet limited to 100 hundred copies. The cover, and illustrations, were by Colin P. Langeveld. Contributors of fiction and poetry were, in order of appearance, Colin P. Langeveld, Ramsey Campbell, Jeffrey Dempsey, writing as 'Daphne De Rose', Mark Valentine (Aklo), Malcolm Furnass, John Howard as 'Sir Oliver Nutherwun', Keith Jones (Nerve Gardens), Joel Lane, Doppleganger Dan, David Cowperthwaite, William A. McCabe, Barry Duggan (Nerve Gardens), and John Whitbourn. Rosemary Pardoe, editor of Ghosts & Scholars, wrote of the collection that it was, "highly recommended and well worth the wait...Aside from the excellent Campbell and Whitbourn stories, the best of the rest are those which give some insight into, or are at least firmly in the spirit of, the Doppelganger Society." With Jeffrey Dempsey, David Cowperthwaite had previously co-edited Dark Dreams. This page was last modified on 16 July 2012, at 12:24. This page has been accessed 7,162 times.